Hey guys! I’m pretty excited about this crostini recipe that I’m bringing you today. 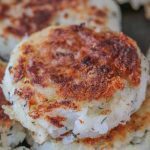 We are still having super nice weather (thankfully) so I’m all about delicious recipes that are no fuss and require minimal oven time. 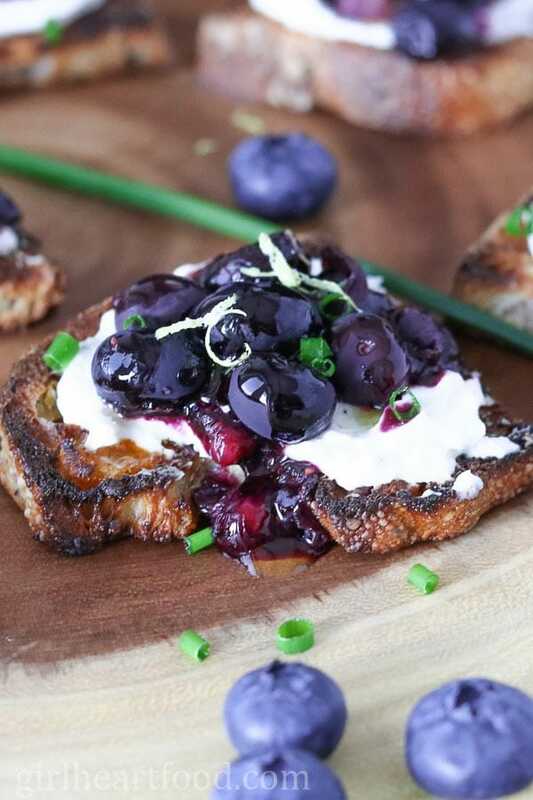 Enter these roasted blueberry and whipped goat cheese crostini! You may know my deep love for crostini. It’s strong, you guys. I think it’s because they are just so darn easy to whip up, they taste delicious (of course) and they are cute little bite-sized things…and who doesn’t love that? These crostini make for one delicious summer bite. Imagine whipping up a batch of these, grabbing some vino and heading out on the deck with friends. Easy peasy fun times, that’s for sure! We have to make the most of summer while we can and that means enjoy alllll the fresh berries. I mean, it’s not like we can’t get berries year ’round…..its just they’re not quite the same in winter months. The berries that I used in this crostini recipe are not Newfoundland berries because they are only just coming ’round. But, when they do, watch out. I may be a little biased, but Newfoundland berries are the bestest (is that a word, lol) berries ever. They are super sweet and I could legit eat them by the handful. Every year my pop picks me a huge bucketful and they are always appreciated. So sweet. I was so happy to receive another shipment of Pomora Olive Oil (you may remember me talking about it last month). Every quarter I get a shipment of delicious olive oil, varying from plain to flavoured ones. Pretty exciting, right? One of the tins that I received was a lemon flavoured olive oil (the other two were a rosemary flavoured one and a spicy one – so yummy by the way). Blueberries and lemon go so well together so I thought this was such an obvious (and delicious) choice. Can you roast blueberries? YES!! Indeed you can. You may remember I shared a roasted strawberry crostini with you guys last year. I could honestly make a meal out of just crostini. Well, maybe crostini and vino 😉 I should start a series – can you roast it? Ha! Well, I lucked out with these roasted blueberries because they turned out wonderfully! They were super simple to prepare and took only minutes to roast in the oven. The end result after roasting was super intensified blueberry-ey flavour, much like blueberry jam only warm. So good, you guys. The other major component of this crostini is whipped goat cheese. Honestly, it’s nothing fancy. It’s simply goat cheese, a bit of salt and pepper and lemon juice. Blend up in a little food processor and it’s creamy dreamy. I used fresh blueberries here. I recommend you do the same. If you use frozen, they will not roast well, it will take longer and the end result will be watery. Ain’t nobody got time for that. Wanna prep in advance? That’s no problem! Keep in mind, though, that the blueberries will cool off….not the end of the world. If you do want to prep in advance, do not assemble these crostini until right before serving or they will be a soggy. These are best eaten once prepared. I used an apricot/walnut bread because that was what was super fresh and caught my eye that day at the market, but you could use whatever bread suits your fancy. Just cut into bite sized pieces as I did here. Speaking of bread, depending on how small or large you cut your bread, will determine how many portions you yield. I would say mine were a standard crostini size and I yielded roughly 10 pieces. To put the icing on the cake (or, er, oil on the crostini) I finished these delicious bites with a little drizzle of lemon olive oil to really reinforce that lemony flavour. Hope you love this easy crostini recipe as much as I do! Preheat oven to 375F. Place blueberries on parchment lined baking sheet and bake for 15 minutes. Remove and lay to one side. Turn oven on broil. Using about 1/2 tbsp of olive oil, brush bread. Place on baking sheet and broil 1-2 minutes until golden brown. Place goat cheese, salt, pepper and lemon juice in a small food processor. Mix until combined and creamy. Spread whipped goat cheese on bread, top with roasted blueberries, chives and lemon zest. Drizzle with remaining lemon olive oil. Enjoy immediately. I think that roasted fruit might just be one of the best things on the planet! I’ve quick-roasted blueberries in a pan on the stovetop before, but I need to try roasting them in the oven like this. It looks so GOOD!!! Oh – you’re too kind, Sarah!!! Thanks so much, my friend 🙂 Happy Friday! How have I never roasted blueberries!?!? These look so yummy, Dawn! Goat cheese is one of my faves too, so this is pretty much the best summer appy ever. These would make a great snack or lunch option! Love the use of blueberry! I’m a huge fan of crostini and bruschettas, but I haven’t really enjoyed them a lot this summer yet. The reason is simple – I love trying new combinations, but I haven’t gotten any new nice ideas. I think I’ve just found the answer. Roasted blueberries sound like an amazing idea. I’ve only tried roasted grapes on crostini before, but I can clearly imagine how beautifully roasted blueberry will work too. Thank you! 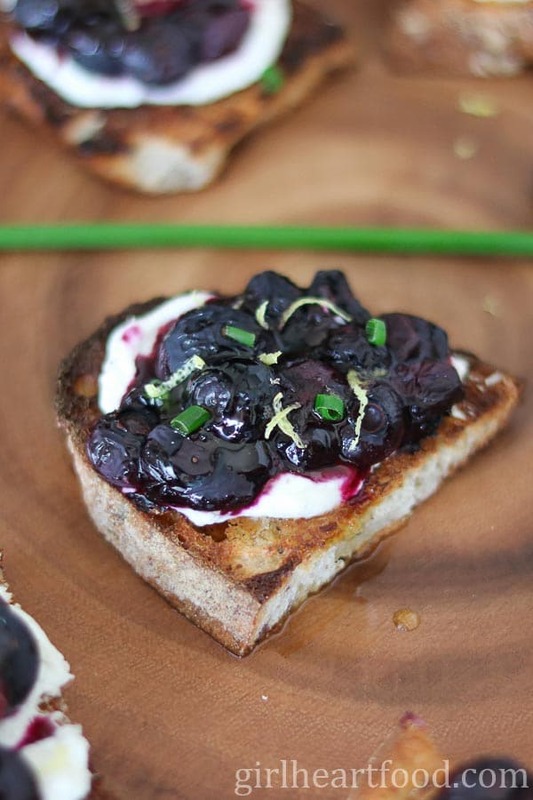 I’m not kidding when I say I legit drooled after I read, “Juicy roasted blueberries, creamy whipped goat cheese, lemony olive oil and freshly chopped chives comes together for one delicious little bite with this ultra easy crostini recipe.” Holy cow, you know how to start a tastebud frenzy! This recipe sounds absolutely fantastic and your pictures are amazing! Hahaha – you’re too funny, Christina! Thanks so much for the kind words! Roasting fruit is awesome. I’ve tried strawberries and cherries but haven’t tried blueberries yet. They are in full force now, I better get to it! And whipped goat cheese? YUM. Flavoured olive oil is the bomb too. Glad to hear you’re getting sunshiny days! Yay! It’s August in a couple of days though. How did that happen?! Have a wonderful rest of the week! Oh those roasted blueberries! I’d be putting them on anything and everything! These sound like such a delicious summer appy Dawn! Haha…right 😉 ?! Thanks Mary Ann! Happy Monday, my friend! Such delicious crostini! I love blueberries too. Never tasted the ones from your whereabouts though:) Hope you really enjoy them once they are ripe for the picking. And the lemon infused olive oil sounds divine! What a great all around combo of flavors and textures packed into these bites! Thank you Milena! Newfoundland blueberries are just so special – so so sweet. Hope you have an awesome week! This sounds so delish. I was drooling at the pics. Blueberries are my favorite and I love this idea. Thanks a bunch, Anvita 🙂 Love blueberries too! This looks amazing!!! I love how you’ve roasted the blueberries and then used them on crostini. I love to eat light bites like this during the summertime. I can make a whole dinner out of just crostini. Yum!! this looks like an awesome snack that I need NOW! I love this mixture of flavors. This may be the prettiest crostini I have ever seen…and I’ve seen a lot of crostini! You are so right, Dawn! Newfoundland berries, particularly blueberries, are the best! These crostini look scrumptious. I’m loving goat cheese and berries together lately, so these sound like snack perfection to me. I’ve never roasted blueberries, or berries of any kind actually, so I need to get on that! I love that final drizzle of olive oil. The lemon flavour is the perfect pairing with the blueberries! Something I never thought to try, roasting blueberries. I love this idea and have to try this while they’re at their peak. OH EM GEE! Girl, can I come for a visit and can we have this for dinner? And also breakfast and lunch? Because it looks SOOOOO good! I know I could easily eat it all day every day and not get tired of it. Plus, how have I never roasted blueberries before? I gotta try it! This looks so elegant and yummy for anytime of the day if you ask me! Loving all the flavors melding together to get that perfect bite of YUM! !